Before I start, I would like to ask you some question. Do you know where to go in Canmore for those fantastic photographs? Will your wedding photographer know where to go? If you hired a photographer from out of the country and you’re flying them in will they know where to go for those spectacular shots? Or, does any of this matter to you? The point is, I have witnessed many disasters with so-called wedding photographers trying to just “wing” it on a real client during their actual wedding day, i.e., for a location, what to do and where to go etc. This is not acceptable, in my opinion anyway. When you employ a professional wedding photographer, you’re investing in them making sure that everything is covered! Right. Unfortunately, in many cases, this isn’t the case. You might ask, well Geoff you travel to the destination locations and you don’t know where to go. Right, so very real. 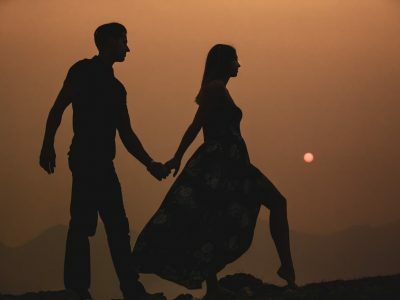 When I’m hired, I will research an area, likely travel a day earlier to the wedding celebration to explore regions, communicate with my couple for what is important to them. After all, when you employ a professional wedding photographer, you will pay a rate that will compensate for their hard to work they put into researching areas. Back to Canmore, quite seriously, where do I begin with this beautiful location, Canmore is THE GATEWAY to The Canadian Rocky Mountains. Canmore is the reason why I emigrated to Canada from London, England over 20 years ago. The town, the community and the stunning surroundings of the Canadian Rockies are almost unbelievable. 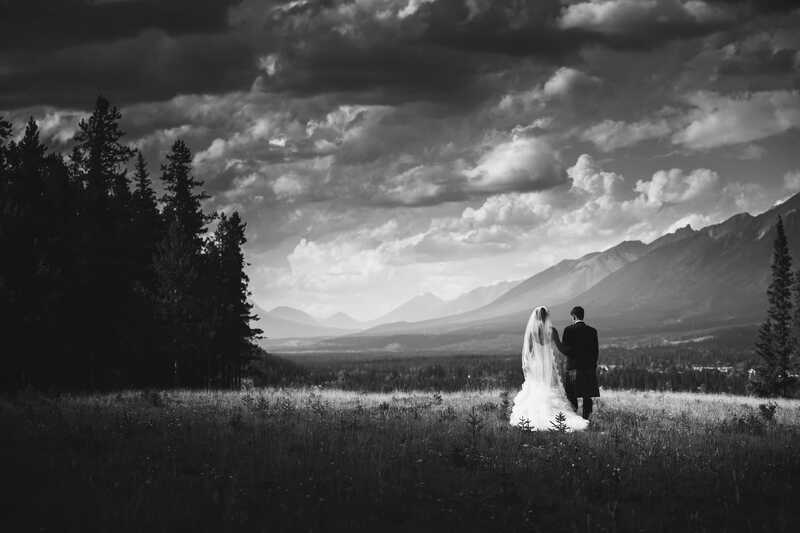 Canmore, Alberta has a few historic buildings, but the primary reason why people visit and book Canmore for their wedding is for the natural landscapes. Your wedding (weather permitting) will make your wedding photos stunning. Canmore wedding photography is without any doubt very similar to Banff, and many say even better. Both generate images that will simply take one’s breath away. With this said, the town of Banff was designed for tourism where Canmore was created for its coal thus being coal mining community. Areas to visit and photograph in Canmore you will find are very different to that of Banff. Quick, easy access areas were created for lookouts in Banff and then yes, you will be paying a premium for having your wedding in Banff but it can often lead to easier access areas of your photos. For me as a Calgary based wedding photographer, it’s always a delight when I get to photograph in areas I simply adore. 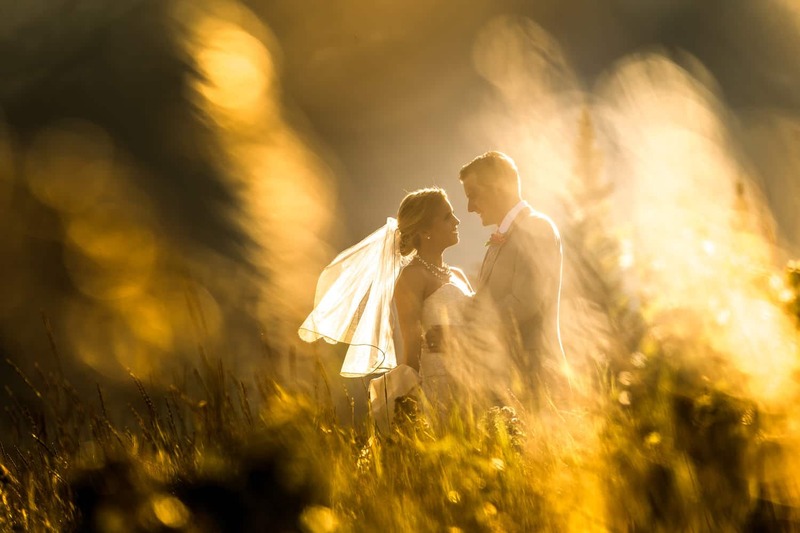 SilverTip Resort and Golf Course is one wedding photo location that stands out within Canmore. Depending what you are after for your wedding day you might wish a smaller venue like bed and breakfast or lodges. If you do decide to start with a B&B just make sure they can cope with the number of guests you would like to invite. On a side notation, these smaller Canmore venues are perfect for an engagement photography session; the intimate location with the Canmore mountains as a backdrop can make for stunning engagement photos. Just a thought. A vehicle is recommended to get around in Canmore. I frequently find that the Bride and Groom and wedding party often hop into a car and venture around to a few hidden locations that I know. Just make sure to allocate enough time for such a creative session. Likely a First Look or earlier Ceremony time might be in order, i.e. 1 pm for example. Depending on the time the Bride and Groom are married most definitely governs the creative session. Set aside enough time for your creative and intimate photography session. Hair and makeup is one area that is extremely important for the bride (and me). 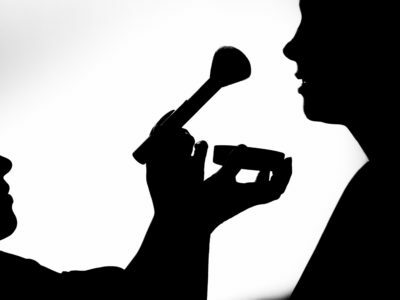 Hair and Makeup become even more critical for a location such as Canmore. If you are not planning on bringing out your known and trusted hair and makeup artist to your Canmore wedding, most definitely do a trial run with the hired artist ahead of time. I have photographed brides that have not had a dry run and needless to say, the makeup or hair didn’t work out the way the bride envisioned. The timing was terrible, which meant our creative time was eaten up because of the “out to lunch” hair and make-up artists. It’s not always their fault if they go over their timing allocated time slot as the client might not have told them exactly what was required. I go over such details in this post (click here). It sincerely kills me when I see brides upset over something that could have been made out ahead of time. It’s you’d like to check out my preferred, and trusted vendors click here to view individuals whom I’ve worked with and trust. Living in Canmore for ten years, I pride myself on my storytelling approach to all of the wedding photography shoots. From the first photos that are taken at the getting ready location to the ceremony, to the hugs and love (receiving line) to family photos and then the reception and party time! I know where to be and what to do to create a story of your day. That’s right I know all about it. 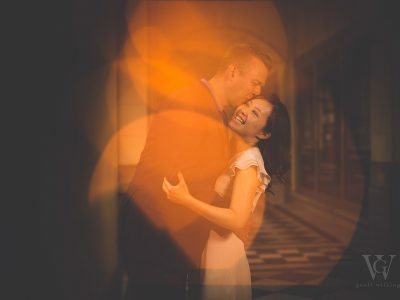 Yes, I am Calgary wedding photographer; however, I am not limited to Calgary, and I will go to any destination location on our beautiful planet to capture incredible moments. You have selected Calgary as your wedding venue but you met in Canmore or just love Canmore as I do. This is fantastic. Let’s get out of the city and photograph your engagement session in Canmore. I’d love the mountains as it sincerely warms my heart, so let’s explore areas for your stunning shots. If you’ve not checked out the shoot, I did at the top of Ha Ling Peak then definitely look into the gallery. So, is Canmore right for you, your partner, guests and family members. So much to think about, feel free to comment or contact me if you have questions.